MSS supply GreenBanks Basalt & Alumina lined products which have been successfully used to extend the life and thereby reduce costs relating to such applications as: Pipe work, Cyclones, Coal Feeders, Hoppers, Fans & Blowers. Cast Basalt is a material formed from Basaltic slag. It is combined with crystallizing agents which is crushed, cast and annealed in a special process. This done, it has two exceptional qualities. Firstly, its abrasive resistant nature, being many times higher in resistance to erosion than iron or steel, Secondly, it has a high degree of chemical resistance. It can be cast in a variety of shapes into sand moulds or spun into cylindrical liners 500mm long. Certain diameters are now available at 1000mm long. Spun liners are available in diamaters between 100mm and 660mm. Cast Basalt has a coefficient of friction similar to that of steel and a density of around 3000kg/m3. When used, the conveyed media polishes the surface improving the coefficient of friction as the linings are used. Cast Basalt can be used for lining of pipe work, chutes, bunkers, cyclones, and hoppers. It has become the world standard in areas such as ash slurry pipe-work, often used at fossil fuel power stations. It is an all round cost effective and adaptable lining material which extends the life of equipment in pipe or tile form where affected by erosion. 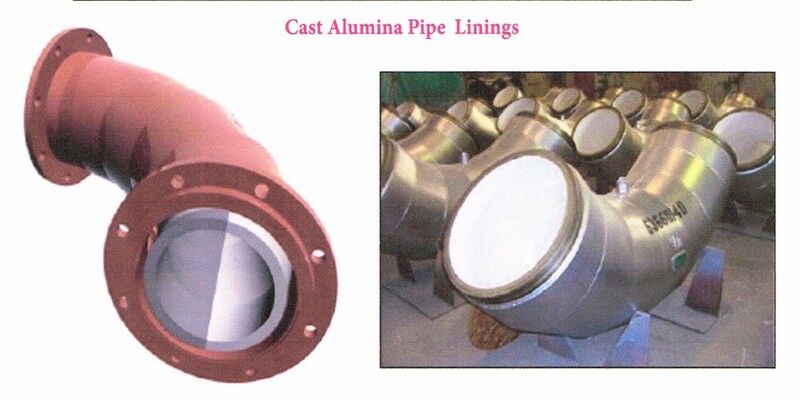 The term Alumina is usually applied to cermamics based predominantly on aluminium oxide and products containing more than 85% are often referred to as high density alumina. Alumina ceramic has been developed and optimized for maximum wear resistance and corrosion resistance. The high density diamond-like hardness, fine grain structure and superior mechanical strength are the unique properties that make it a material of choice for a wide range of demanding applications. For uses similar to Cast Basalt but where greater resistance to wear especially in high velocity lean and dense phase systems is required. Alumax ISO Pressed tiles – Weldable System Where high heat, impact or corrosion are considerations, attachment by welding is advisable. The weldable system permits use of GT Alumina liners to temperatures in excess of 550ºC. Tiles are supplied with a tapered hole, metal insert and an Alumina cap.